In the dystopian future of the new Image Comics maxi-series The Few, extremists have overrun the United States and turned it into a toxic wasteland. It’s a concept not all that far from reality, given the current political power of white nationalists and the growing threat of contaminated water sources, and writer Sean Lewis and artist Hayden Sherman are tapping into very real fears with their sci-fi action thriller. Lewis’ story centers on a young woman, Hale, discovered by two brothers in the woods; these preview pages from the first three issues of the The Few spotlight Hale in various circumstances. 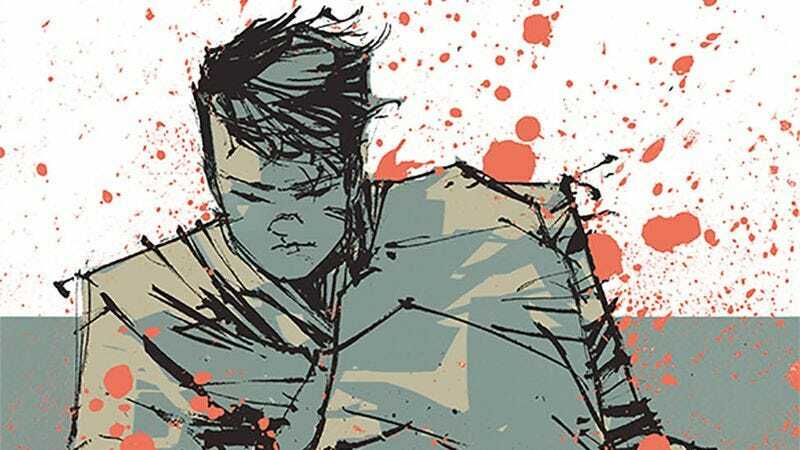 The lettered sequence from The Few #1 reveals the brutality of Hale’s home, and the unlettered pages offer a glimpse at the world beyond the trailer park, one full of wonder and danger. Hayden Sherman is a newcomer in the comics industry, but these preview pages indicate that he has a bright future ahead of him. His character and environment designs are evocative and dramatic, and his scratchy line work brings a gritty texture to this world. His panel composition features bold graphic elements that make the images pop, and the limited color palette plays a huge part in that visual impact. The two-page spread revealing a heavily populated metropolis is a striking display of Sherman’s talent, and the detail put in the design, inking, and layout creates an instantly compelling setting. Readers can discover more of this dystopian America when The Few #1 hits stands on January 18, but in the meanwhile, here’s a sample of assorted pages from the first three issues.